August already! Today I had a cashier tell me, "I feel like the year is over. Once July ends, the rest of the year is just a blur." We still have some summer yet, so let's have a reunion! 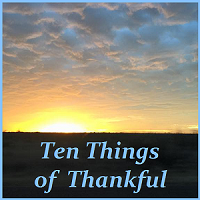 If you've ever participated in the Ten Things of Thankful blog hop, we invite you back! Don't worry--we aren't asking for a weekly commitment (though of course you're always welcome)--but we'd love to hear a little update from you. If you've never participated in the TToT, we'd love to meet you, too! So put on those name tags, people, and introduce yourself. This is a no-pressure group, and you're invited! Yes, yes! I am ready for a reunion!